Today’s Flash Back Friday comes from Episode 201, originally published in January 2014. 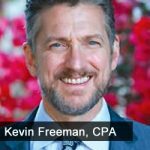 Kevin Freeman is the author of, “GAME PLAN: How to Protect Yourself from the Coming Cyber-Economic Attack.” He’s a leading expert in economic warfare and financial terrorism and CEO of Freeman Global Holdings. He’s the former Chairman of Separate Solutions, Inc.
Freeman discusses how terrorists hit the economy in 2008 and what they’re planning next to hit the US financially. Freeman explains how an economic attack would affect jobs, real estate, and 401ks. The conversation then shifts to what people can do to prepare themselves, and surprisingly, buying gold isn’t the answer. Freeman dubs this practice “disaster economics.” He also shares the steps America should take to avoid economic disaster.